Por Tahn Chin or Por Tahn Mueng, Ampher Mueng, Jangwat Yala is the only one that inherited Wichah (magic chant) from Pra Ah Jahn Wat Chianghai. 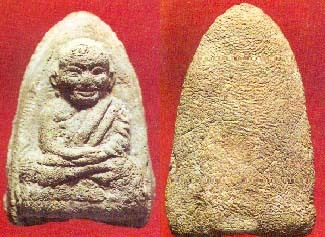 Por Tahn Chin was the disciple of Pra Ah Jahn Tim, although both of them are from different temples. Due to that, Pra Luang Poo Thuat chanted by Por Tahn Chin are also very popular. In BE2505, Pra Ah Jahn Tim, Por Tahn Chin, Luang Dtah Num and the District Head of Yala set out to pay respects to the holy places which had rested the body of Luang Poo Thuat during the transfer of his body from Ratthaiburi (a province belonged to Thailand in Malaysia at that time) to Thailand several hundreds years ago. There are a total 13 resting holy places. Whenever they reached one of the holy places, Ah Jahn Tim and Por Tahn Chin would sat in sammahdti and requested Luang Poo Thuat permission to gather some soil from the holy ground. The soil was intended for the making of the first batch of amulets from Wat Mueng. On 27th March BE2505, Ah Jahn Tim went to Wat Mueng to create this batch of amulets. A total of 10,000 pieces were created more than one month period. There are 3 different pims; Pim Yai Piset (Special Large mould), Pim Yai (large Mould) and Pim Lek (Small Mould) or also called Pim Pra Rohk. After creating the amulets, Ah Jahn Tim and Por Tahn Chin chanted the amulets. The amulets were later transported to Wat Chianghai and chanted again on 19th May BE2505 during the the chanting of Pra Luang Poo Thuat Lang Dtow Dtree and Lang Dtua Nangsue. This chanting was the biggest chanting ceremony ever held in Wat Chianghai. The amulets were distributed to the devotees on that day. As such, many people misunderstood that this batch of amulets were from Wat Chianghai and all of them rushed for the amulets inside the main hall. Some devotees were unable to enter the main hall, thus the amulets were distributed through the windows. Therefore, this batch of amulets from Wat Mueng was called Pra Luang Poo Thuat Roon Nah Dtang (Window Batch). This batch of Luang Poo Thuat amulets from Wat Mueng are so popular because firstly, the materials used were the soils from the holy places and mixed with Neua Wahn of BE2497. Secondly, the amulets were chanted during the chanting of Pra Luang Poo Thuat Lang Dtow Dtree and Lang Dtua Nangseu which was the biggest chanting. Lastly, the fact that Ah Jahn Tim was the one who created this batch of amulets at Wat Mueng. If you like Luang Poo Thuat Amulets, this is one of the batch that is worth collecting, besides Luang Poo Thuat amulets from Wat Pako, Wat SaiKaow and Wat Yiammuaranut. The price is between a few thousands bahts to 10,000 bahts.